Don’t bet on a good night’s sleep after seeing this Pilsen-set ghost story. I’d use just one word to sum up the opening-night audience’s reaction to Isaac Gomez’s terrifying new drama, The Displaced: Nope. It’s a word that means the speaker is rejecting the events happening in front of them. And while for many shows, that sentiment might indicate a bad time, it means something entirely different for this horror play. It’s what people say when they want to run and hide, because what they’re witnessing is so freaking scary. Even the play’s set is unsettling. 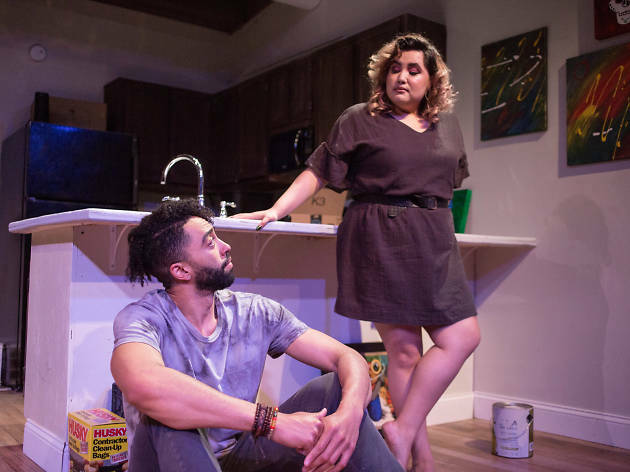 It unfolds in a slightly decrepit Pilsen apartment where two hip young things, artist Lev (Rashaad Hall) and actress Marísa (Karen Rodriguez), have just moved in. Designed by Arnel Sancianco and lit with equal parts light and shadow by Erik S. Barry, the space is overwhelmingly familiar. Anyone who’s been up late at night and suffered an irrational bout of the creeps will feel a similar sensation here. The kicker is the long, Kubrickian hallway leading to the front door. It’s located smack dab in the center of the set, lending it an ominous allure. Something scary is going to happen in that hallway, you just know it. The only problem is that you don’t know how or when it’s going to occur. And when it finally does, it’s actually a relief—or it least it would be if you weren’t so busy screaming. The Displaced, directed by Jo Cattell with metronomic precision, unfolds in real time over the course of about two hours. 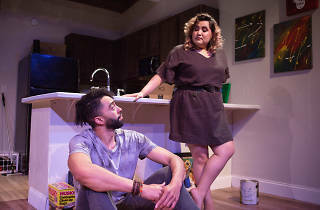 Though the play opens with a paranormal touch—a book falling off the shelf seemingly of its own accord—a great deal of its stage time is committed to everyday concerns. Lev and Marísa have moved in together to try and jumpstart their stalled relationship. Lev, who is black, insists that they qualify as gentrifiers, while Marísa, who is Mexican, argues that they are not. Gomez manages the singular task of forging characters that are flawed and irrational, without having to impose those flaws onto them. (When it comes to making characters dumb for the sake of plot, horror movies and romantic comedies are the two biggest offenders.) As such, Marísa and Lev’s bickering feels unnervingly realistic, and the action unfolds almost as a series of loops: They talk, they fight, they make up, they talk, they fight, etc. At times, their arguments seem a little too lifelike, dragging slightly when they should be ramping up. All the while, the play’s supernatural elements—lights flickering, objects falling, strange knocks, an increasingly sentient Alexa—slowly encroach upon its domestic ones. (Sarah D. Espinoza’s excellent sound design does some very heavy lifting). The second you start to wonder if the real horror is the relationships we screwed up along the way is the moment when things really pop off. It would seem that the apartment’s previous tenant, a Mexican woman with a troubled marriage who mysteriously disappeared while being evicted, is not ready to give up the place. Lev is completely in the dark (sometimes literally), but Marísa is not. She knows they shouldn’t touch the tarot cards Lev finds in their attic and that he should not read the name on that old photo out loud. The Displaced. By Isaac Gomez. Directed by Jo Cattell. With Karen Rodriguez and Rashaad Hall. Running time: 1hr, 40 min; no intermission.